The economic backdrop in the first quarter was muddled, with extraordinarily severe winter weather throughout much of the country adversely impacting economic reports into March. Early in the quarter the uninspiring data, combined with concerns about emerging economies, was enough to prompt a sell-off in the stock market. Investor angst was already elevated due to the Federal Reserve’s (“Fed”) decision in the previous quarter to begin tapering its asset purchases. In addition, the Fed transitioned to a new chairman in the first quarter, with Janet Yellen assuming leadership of the central bank, taking over for Ben Bernanke. By the end of the quarter, however, economic trends began to improve coincident with the warming weather. The Bureau of Labor Statistics raised its third estimate of fourth quarter gross domestic product (GDP) to 2.6%, as consumer spending was stronger than anticipated. The employment situation also enjoyed an uptick, with a better-than-expected 175,000 jobs added in February, and while the unemployment rate actually rose modestly to 6.7% from January, it was below the 7.0% reading from three months earlier. Globally, the primary storyline involved emerging economies, which were negatively impacted both by fears of how the Fed’s tapering decision would impact liquidity, as well as slowing growth in China. These concerns caused emerging markets stocks to swoon during much of the quarter, although performance began to recover late in March. Emerging economies with current account deficits will be under pressure as U.S. interest rates rise. In the eurozone, economic gains continued to be slow but steady as the region recovers from its deep recession. Real GDP increased a relatively modest 0.3% on a quarter-over-quarter basis, but policymakers were encouraged that it represented the third consecutive gain. The European Central Bank (ECB) remains concerned about downward pressures on the region’s economy, and stated that it will take necessary action to provide stability to the economy. During the first quarter the Federal Open Market Committee (FOMC) made a change to its forward interest rate guidance, eliminating the quantitative thresholds for triggering rate increases. The FOMC had previously stated that it would increase short-term interest rates if the unemployment rate fell below 6.5% and inflation was above 2.5%. The FOMC stated that the removal of the thresholds was not intended to be an indication of a policy change, but the consensus among economists is that rates will begin to rise sooner than previously anticipated, perhaps in early 2015. The Bureau of Economic Analysis released the third estimate of the fourth quarter 2013 real GDP, a seasonally adjusted annualized rate of 2.4%, down from the 4.1% annualized growth of the prior quarter. The slowing growth was primarily a result of inventory accumulation serving as less of a contributor as in the prior quarter. One encouraging sign in the data was that growth in final sales slowed only slightly in the fourth quarter. In addition, the fourth quarter data captures the beginning of the severe winter weather that gripped much of the U.S. The weakness in federal government output was a result of the government shutdown early in the quarter. Inflation remains relatively benign, with the personal consumption expenditures (PCE) index of prices gaining 1.0% during the quarter, a slowed rate than the 1.9% from the prior quarter. Many economists see encouraging signs in the economy, including robust corporate profitability and competitiveness, lower levels of household debt, strengthening credit conditions, and an improved fiscal environment. For these reasons, the consensus seems to be that GDP should accelerate to 3% in 2014 and 4% in 2015. During the first quarter of 2014 the housing segment continued to consolidate the strong gains posted over the past couple of years, as rising mortgage rates and an unusually severe winter have slowed the pace of sales. Existing-home sales for February (the latest monthly data available) advanced at an annualized rate of 4.6 million units, on par with the prior month but below the 4.9 million unit rate posted in November. In addition, the rate has declined each of the past six months. The inventory of existing homes remained tight, however, with 5.2 months of supply. Existing-home prices also continue to rise, but at a slowing rate, with the median price up 9.1% from a year ago (year-over-year gains in mid-2013 were about 12%). In the new-home segment, the NAHB Housing Market Index, a measure of homebuilding activity, ended the quarter at a level of 47, down sharply from the previous quarter’s reading of 57. The harsh winter is cited as one factor in the drop, but housing analysts also point to the fact that first-time homebuyers are not in the same financial condition as in the past. However, with home inventories being low, analysts believe that new-home construction (and sales) should accelerate as job growth and income continue to improve. Despite the unusually harsh winter weather that has at least temporarily affected most economic data, the employment situation showed some resiliency, posting better-than-expected payroll gains. Gains were greatest in the service-related industries and the public sector. The February payroll report, the latest available, showed a gain of 175,000 jobs, well above consensus expectations of a gain of 125,000. As with the previous quarter, there were revisions higher from prior months, but they were relatively minor. The average number of jobs added for the three months ended February was 129,000, well below 2013 levels. Accompanying the payroll gains in February was a rise in the unemployment rate to 6.7% from 6.6% in January, as more workers entered the workforce during the month. Despite the better-than-anticipated report, the labor force participation rate remained at 63%, an indication that a sustained upturn in employment growth has not yet occurred. While weather has certainly adversely impacted job growth, analysts also cite the negative effects of the Affordable Care Act, as companies have become more mindful of the associated costs. On balance, however, the consensus among economists is that employment growth should accelerate to about 200,000 jobs per month in the second quarter of 2014. The Federal Open Market Committee (FOMC), for the third consecutive meeting, decided to reduce its monthly asset purchases by $10 billion. Beginning in April, the FOMC will be buying $30 billion of Treasury securities and $25 billion of mortgage-backed securities, down from a total of $85 billion at the peak. In its announcement, the FOMC also stated that the asset-purchase program could end later this year, and that interest rates could begin to rise in 2015, catching market participants somewhat off-guard. The FOMC also changed its forward guidance somewhat, breaking the link between an unemployment rate of 6.5%, an inflation rate below 2.5% and interest rate rises. When asked to specify how long interest rates might remain low, new FOMC chairman Janet Yellen said that it could be for “around six months” after the end of the asset purchase program. Fixed-income securities experienced somewhat of a recovery in the first quarter following the poor performance of 2013. The primary driver of the solid performance was concern about the pace of economic growth. In addition, due to the situation involving Russia and Ukraine, investors sought a safe haven and gravitated toward U.S. Treasury securities. While performance was positive for each of the first two months of the quarter, March’s results were weaker as the economy rebounded. The result of this backdrop was a continued flattening of the yield curve during the quarter, as short- and intermediate-term rates remained relatively steady, while longer-term rates declined modestly. During the quarter, performance was strong in January and February, as soft economic data, emerging economies’ difficulties and geopolitical tensions produced a flight-to-quality. By the end of the quarter, the yield on the benchmark 10-year U.S. Treasury had fallen to 2.72% from 3.03% on December 31st. Yields began dropping at the start of the quarter, reaching a quarterly low of 2.58% in early February, but began to rebound as economic data improved and investors realized that the soft patch was weather-related and likely temporary. 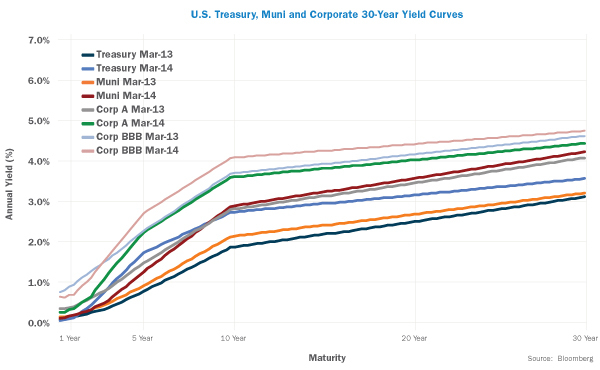 With this environment as a backdrop, yields overall were generally flat, particularly on the short-to-intermediate segment of the yield curve. The yield on the 3-month T-bill remained steady at 0.06% at the end of the first quarter, approximately the same level as the previous quarter. Similarly, the yield on the five-year Treasury was little changed, easing to 1.72% on March 31st compared to 1.74% on December 31st, and as mentioned above, the yield on the 10-year Treasury declined to 2.72% from 3.03% over the same period. Inflation expectations remained contained during the quarter, with the Fed’s gauge of five-year forward inflation expectations closing at 2.45% on March 31st, down from 2.69% on December 31st. Credit securities were also little impacted by the Fed’s decision to continuing tapering its quantitative easing program and change the format of its forward-looking guidance on interest rates. The yield on the Barclays 1-3 Year Credit Index was little changed, dropping a mere one basis point to 0.99% from 1.00% during the quarter. Intermediate credit yields were generally lower, with the yield on the Barclays 7-10 Year Credit Index falling to 3.72% on March 31st from 4.02% on December 31st. The generally positive environment for the equity market during the quarter once again benefited high-yield securities. The yield on the Barclays U.S. Corporate High Yield Index declined to 6.10% from 6.36% at the end of the fourth quarter. Municipal bonds generally fared well during the quarter, as an improving economy has meant municipal default rates have declined, according to Bloomberg. As a result, municipal yields trended lower during the quarter, with the yield on the Barclays Municipal Bond index dropping to 2.71% at the end of the quarter from 3.15% as of December 31st. Of course the big news of the quarter concerned Puerto Rico, which issued $3.5 billion of new debt. Investors and analysts have been concerned that as a result of an economy that has shrunk 14% since 2006, the territory would not be able to make payments on its outstanding $72 billion in obligations. In terms of total returns, fixed-income securities generated relatively robust results in the quarter, with both government securities-related and credit indices posting gains. The Barclays Treasury 5-7 Yr. Index advanced +1.2%, and the Barclays U.S. Corporate 5-10 Yr. Index gained +2.9% during the quarter. High yield securities also gained ground, posting a +3.0% advance. Municipals also delivered healthy returns, with the Barclays Municipal Bond Index rising +3.3% for the quarter. 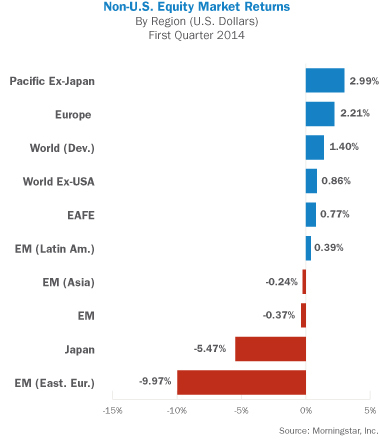 International fixed income also performed well, with the Barclays Global Aggregate ex-U.S. Index advancing +2.8%. Within a backdrop that included uncertainty on the economic front, modest employment gains, continued asset purchase tapering by the Fed, and geopolitical tensions, domestic equities were volatile, but generally ended the quarter with moderate gains. The broad indices dropped sharply in January after having finished the year near record highs. The early-year sell-off was due in part to the problems facing emerging economies, as well as general profit-taking after substantial gains in 2013. Prices rebounded in February, erasing January’s losses, and then posted mixed results in March, with some indices generating positive returns while others declined. For the quarter, the S&P 500 gained +1.8%, its fifth consecutive quarter of gains, the longest streak since 2007. Perhaps more than in any recent quarter, sector selection was of the utmost importance, as dispersion of returns across the ten primary economic sectors was wide. The utilities sector, which had been one of the poorest performing for several quarters, was the best performer in the first quarter, posting a gain of +10.1%. Health care was also a strong performer, with a return of +5.8%. Middle-of-the-pack performers were the materials, financials and information technology sectors, with gains of +2.9%, +2.6% and +2.3%, respectively. 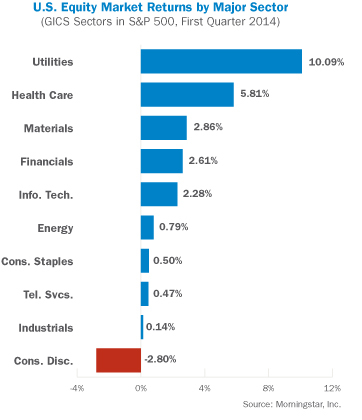 One sector finished with a negative return for the quarter: consumer discretionary, which posted a loss of -2.8%. 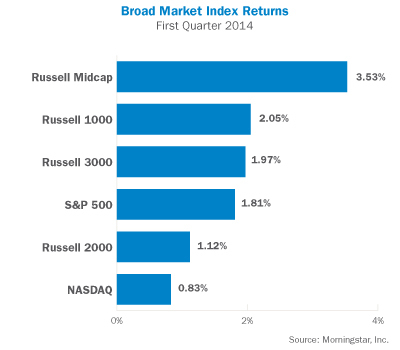 For the quarter, the Russell 1000 Index of large capitalization stocks generated a +2.1% total return. Within the large-cap segment, value stocks significantly outperformed growth stocks. Small capitalization stocks, as represented by the Russell 2000 Index, once again underperformed large-caps during the quarter, ending with a total return of +1.1%. As in the large cap segment, value outperformed growth within the small cap universe. The Nasdaq Composite, dominated by information technology stocks, generated a return of +0.8% during the quarter, with performance in March being particularly poor. The Dow Jones Industrial Average of 30 large industrial companies declined -0.2% during the quarter, not being able to recover from severe losses in January. Commodities and Real Estate Investment Trusts (REITs) were two of the top-performing segments in the first quarter. With investors perhaps discounting improving conditions in developing regions of the world, commodities generated solid gains after disappointing results in 2013. As a result, the DJ UBS Commodity Index advanced +7.0% for the quarter ended March 31st. Similarly, REITs staged an impressive rebound from last year’s poor results that were largely a result of investor anxiety over the possibility of higher interest rates, which hurt REITs. As interest rates generally trended lower during the first quarter, REITs benefited, with the DJ US Select REIT Index gaining +10.4%. International stocks once again could not quite match the performance of U.S. equities during the first quarter. The eurozone’s more muted growth prospects and the uncertainty for the outlook of emerging economies kept performance in check. There were pockets of strong performance however, with German stock indices advancing for the seventh straight quarter, the longest streak since 1998. The MSCI EAFE Index of developed markets stocks gained +0.8% during the three months ended March 31st. As with sector performance in the U.S., regional performance was extremely varied during the quarter. The Pacific region (not including Japan) was the strongest performer, with the MSCI Pacific ex-Japan Index posting a gain of +3.0%. Europe also posted moderate gains as the region continued to experience modest economic recovery. The MSCI Europe Index advanced +2.2% for the quarter. Emerging markets performance lagged over the past three months, but the recent trend shows better relative performance may be ahead. The MSCI Emerging Markets Index posted a loss of -0.4% for the quarter, but generated a +3.1% return in March. Despite the economic uncertainty that prevailed during the first quarter, there are signs that the underlying economy is improving steadily, and that the lackluster results of the past three months were merely weather-related. Employment gains, while moderate, were accompanied by robust income growth, which is likely a positive sign for future payroll improvement. In addition, underlying factors – including strong corporate profitability - are in place for a rebound in business investment. An argument could be made that businesses in general are in the best position ever, with treasuries flush with cash, low debt levels and extremely high profit margins. Even companies that are leveraged have by and large locked in low interest rates, meaning cash flow used for debt service should not rise significantly as interest rates rise. An improving fiscal outlook is also a positive. Lawmakers have recently avoided the animosity of previous budget and debt-ceiling showdowns, and several years of fiscal austerity should continue to reduce the federal deficit as a percentage of GDP. Under these conditions, growth should accelerate this year and next, with potential risks to this outlook being deterioration in emerging economies, a resurfacing of the eurozone financial problems, or heightened geopolitical tensions.